Proper heating and cooling are essential to our lives. Modern homes require efficient systems for comfort and functionality. Obviously, nothing beats the summer heat like a good air conditioner. Similarly, there is no substitute for escaping from the harsh winter cold into a warm home. But, what happens when problems occur with these systems? It’s not just your family’s comfort at risk. Health issues surface when our environment is too hot or too cold. That’s why it’s so important to have an HVAC specialist you can trust. Aspire Heating and Cooling in the Winston-Salem area has the experience and expertise to help. Whether you’re facing an air conditioner condenser frozen or lack of heat, they can fix it. 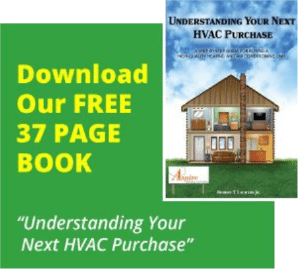 What is an A/C Condenser Coil? However, the problem is that this coil can sometimes freeze. Since the refrigerant flows through the tubes back to the coil, it can sometimes leak or get too cold. This is what leads to an air conditioner condenser frozen situation. Unfortunately, when this happens, the coil can become frozen in solid ice, compromising the functionality of the unit. Worse, it can lead to leaks and other serious problems. Of course, if you’ve ever faced an air conditioner condenser frozen then you know how frustrating it can be. Let Aspire check to make sure your unit is functioning properly to avoid this problem. Aspire’s experienced technicians offer personalized solutions and friendly service. By offering several maintenance packages, you can receive regular checkups for your HVAC system. This service is budget-friendly and you can choose the package that fits your needs. Therefore, by having seasonal maintenance, the technicians can find small problems before they become major (expensive) issues! In fact, they believe in honest pricing and reliable technicians to provide all customers with quality service that is unmatched. You can trust their experts to solve your problem and get you back to comfort in no time. Moreover, Aspire offers 24/7 service, repair, installation, and more. They can even help with setting up a generator so you can be prepared in bad weather. So, give them a call today at 336-936-9111. Then, you’ll be ready the next time you face a problem with your heating or cooling.